Ballymena United manager Glenn ferguson and striker Matthew Tipton at last week's Irish Cup semi-final press conference. Picture: Press Eye. Ballymena United boss Glenn Ferguson believes his players can produce another memorable Irish Cup night in Saturday’s semi-final. 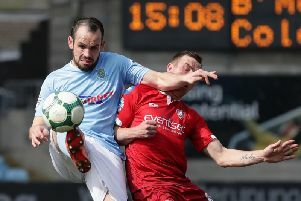 The Sky Blues take on Portadown at the Oval (5.30pm), having stared elimination in the face in each of the previous two rounds against Cliftonville and Harland & Wolff Welders. If we go with the attitude of trying to out-work Portadown, trying to create more chances and defending desperately well, we can win the game. “It’s an Irish Cup semi-final and regardless of who you’re playing against, it will be a tough, tough game,” said Ferguson. “Portadown have good players who can play out of position so the loss of their two suspended players isn’t going to make that big a difference, albeit Chris Casement and Robbie Garrett have been two of their best players this year. “An Irish Cup semi-final can go any way - the team who turns up on the day will be the one who goes through. “If we go with the attitude of trying to out-work Portadown, trying to create more chances and defending desperately well, we can win the game. “We conceded five in our last meeting with Portadown but also scored five - although I’d rather not have that sort of heart attack material again! The manager hopes to have defender Johnny Taylor available after his foot injuiry sustained in the quarter-final win over Harland & Wolff Welders proved to be not as serious as first thought. “Johnny is a tough lad and he is determined to make Saturday’s game, but we will have to wait and see,” said ferguson, who won’t have the services of another centre-back, Davy Munster, who sustained a groin strain in training. Gary Thompson and David Cushley have completed bans and will be available for selection. * Admission is payable at the gate.